'Hey King Cat fans, I'm Dan and I've been slowly putting together a video document of John P./King-Cat/Spit and a Half, and I need your help. I'm looking for 15-20 folks to record themselves reading their favorite John P. comic, poem, story, Snornose, Top 40, etc. These audio pieces will play over exciting footage of John driving, eating, walking around Elvis' birth house, standing alone at zine convention tables, and obviously, the images of the comics themselves. If you'd like to participate, simply record yourself in some form of digital audio. It can be recorded on your phone or computer in just about any format. Wav, FLAX, MP3, whatever you like, I can work with it. When you record it, please remember to speak slowly and clearly, so that folks can read/listen along, and include as part of the audio + the email sending it the title of what you're reading and where it's from, so that I can track down the images as well. Please include your name in the filename you send. Deadline is September 1, 2013 so time is of the essence! If you have questions, ask them in the comments and I'll answer right away! I'm back from PFC/Autoptic -- which was seriously one of the best weeks of my life! I'm still processing it all and will have a detailed blog post up soon... BUT I'm heading back out on the road this weekend, to Michigan, for the first annual (?!) Grand Rapids Zine Fest. I'll start getting pictures etc from PFC up when I get back! SO... 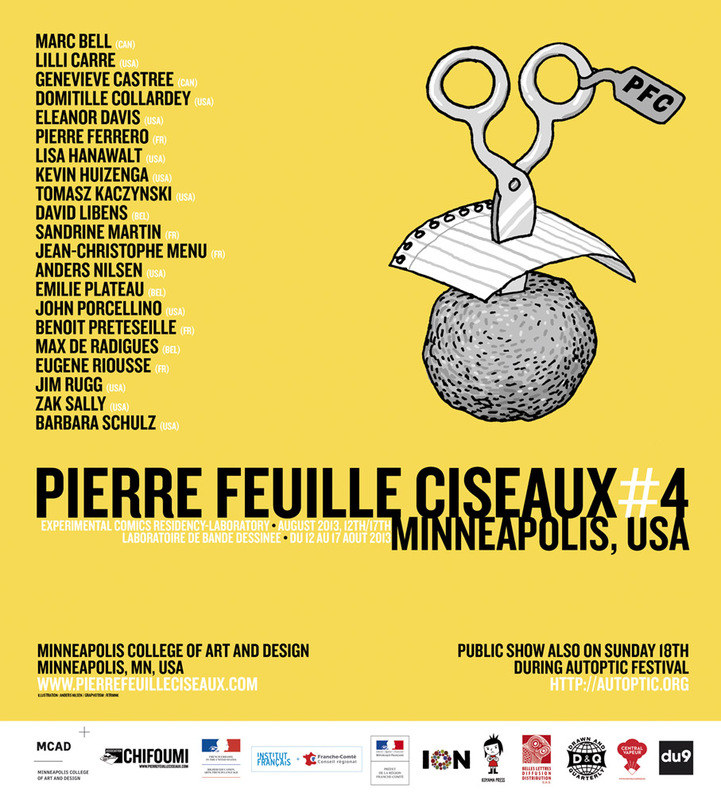 I'm heading up to Minneapolis in a few days, to participate in PIERRE FEUILLE CISEAUX 4, a France-based collaborative workshop for comics artists. I'm so excited to be able to attend. I was invited once before, but because of my ear problems I can't fly, so I had to say no. Well, this time PFC is being held in good ol' Merka, so I get to join in. The culmination of PFC is the brand new AUTOPTIC FESTIVAL on Sunday August 18. 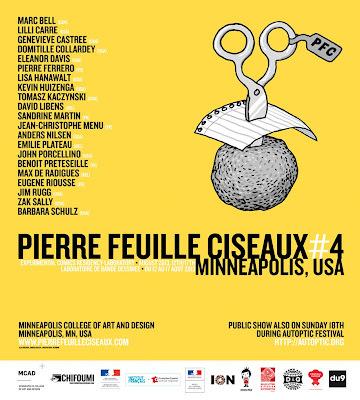 Thank goodness Minneapolis has an art-centric comics show again! 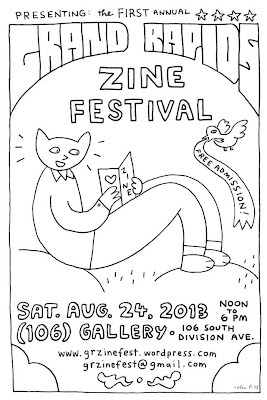 I'll be tabling there with lots of Spit and a Half goodness AND, I HOPE, King-Cat #74 in some form or another (probably a special short run edition printed especially for Autoptic). UPDATE: I was stressing like crazy trying to come up with a way to get KC 74 out in time for Autoptic, and I'm getting too old for that. So, no, it won't be available there. But it will be out shortly thereafter -- late August/Early September! Thanks and sorry! Which means -- KC 74 should be out in its regular edition very soon. I'll finish inking the pages this week and put it together next week in time for the Fest. SO, if you're a subscriber and your address has changed since last year, now would be a good time to drop me a line and let me know (johnp_kingcat AT hotmail DOT com). 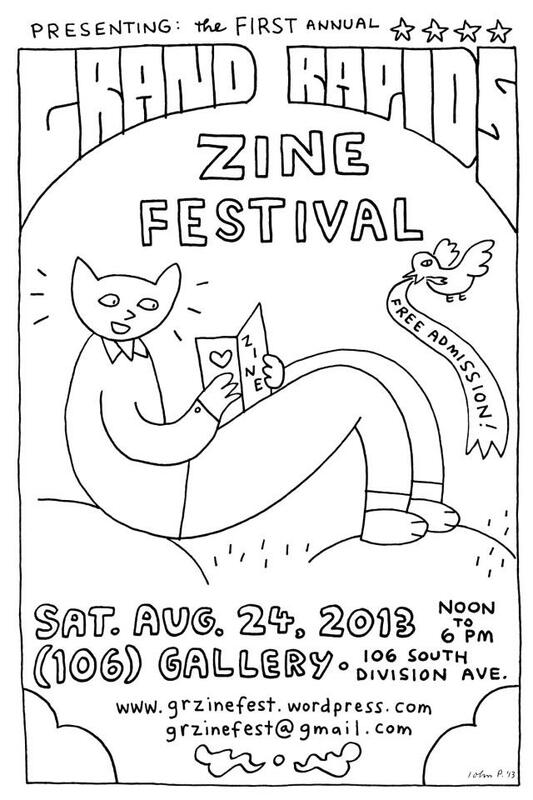 When I get back from Minneapolis I'll get the files to the printer, and then the following weekend I'm off to Grand Rapids, Michigan for the first ever GRAND RAPIDS ZINE FEST (Sat. August 24), for which I drew the poster! ALSO, I'm now on TWITTER: @The_Real_John_P. What a dork.